Potentially, a government is the most dangerous threat to man’s rights: it holds a legal monopoly on the use of physical force against legally disarmed victims. When unlimited and unrestricted by individual rights, a government is men’s deadliest enemy. It is not as protection against private actions, but against governmental actions that the Bill of Rights was written. What is it that is making people wake up to the dangers of a rights-violating government? Perhaps it’s the “glitch”-ridden Obamacare takeover of the healthcare industry, along with the creepy suggestions coming from on high that we discuss Obamacare with our families and friends during holiday gatherings. Or maybe it’s the fact that government seems to be trying to control more and more aspects of our lives as the years go on. We’ve canceled the item(s) and apologize for the inconvenience. If you see a charge for the canceled item, we will refund you within 1-2 business days. Ugh. Thanks, George W. Bush. Thankfully Stephen Green (VodkaPundit) has done the heavy lifting, researching the legal alternatives we now have to the traditional incandescent bulbs. He says he’s as picky about the quality of light as I am and assures his readers that one brand of LED bulbs provides light comparable to my beloved Reveal incandescents. To read which type he recommends, go read his blog post here. The LEDs will apparently save us money on our electric bills, if that’s any consolation. Yeah, they called me a crazy old man a few years back when I started squirreling away normal human light bulbs. I only have four 100-watt bulbs left. I’m saving them for a special occasion. God help us. CFLs actually work pretty well, with certain very specific exceptions. That said, the ban was moronic, even by DC standards. I can’t wait for the LED bulbs to hit that price break soon. Walmart’s is pushing them, so I expect that within the next 6 months, give or take. 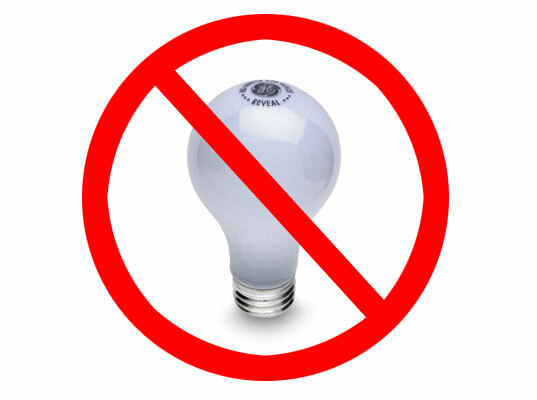 My brother pointed out a story to me on The Blaze about a company that is, at least for now, able to make a version of incandescent bulbs that fit an exception in the new law, for “rough use” bulbs.